Part of the armor of God, as described by the apostle Paul, is the shoes of "the preparation of the gospel of peace." What good are shoes? And more importantly, what do they have to do with the gospel of peace? Let's find out. 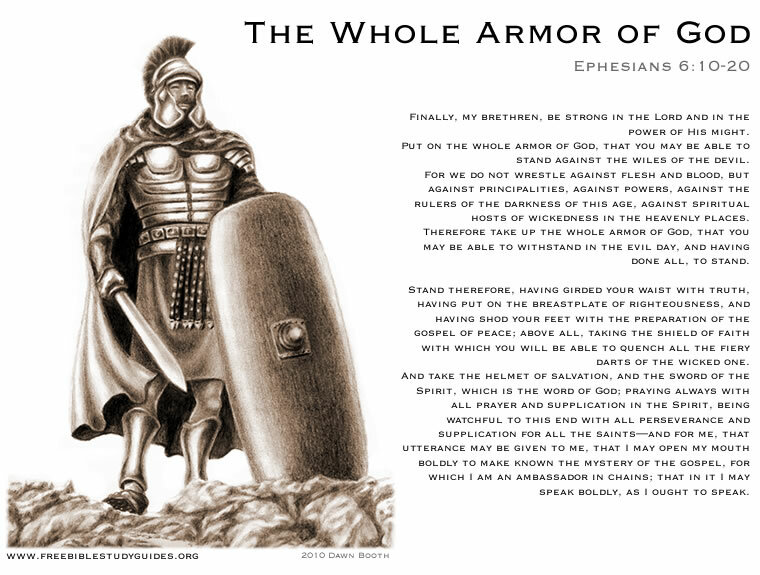 The third piece of armor Paul mentions in Ephesians 6 is the shoes of "the preparation of the gospel of peace." What purpose did shoes serve for a Roman soldier? What purpose do these spiritual shoes serve for us? The brethren gathered around, desperately trying to convince Paul to abandon his plans to travel to Jerusalem. They had heard the prophecies about the fate that awaited him on this journey—Paul himself said that he did not know what to expect, "except that the Holy Spirit testifies in every city, saying that chains and tribulations await me" (Acts 20:23). Paul's brethren and fellow workers couldn't bear the thought of their friend willingly walking into this, and begged him to reconsider. But God, through His Holy Spirit, had summoned Paul to Jerusalem (Acts 20:22)—and Paul was intent on answering that call. Knowing that the upcoming trip could very well mean the end of his life, he says to his would-be dissuaders, "What do you mean by weeping and breaking my heart? For I am ready not only to be bound, but also to die at Jerusalem for the name of the Lord Jesus" (Acts 21:13). 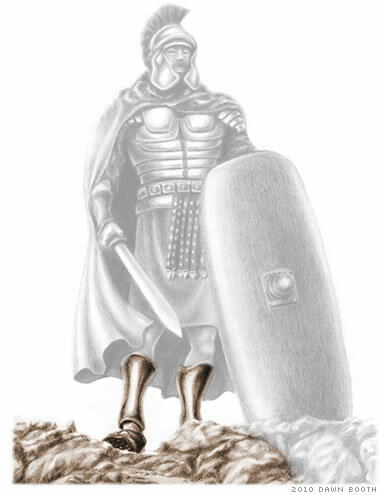 Paul did not just write about the armor of God; he also wore it. At this time in his life he was able to call upon the shoes of the preparation of the gospel of peace. He found protection and strength in the knowledge of what God's gospel meant for him and for the others he shared that good news with. His footing was sure and unshakable, and he was prepared to carry the gospel wherever God sent him. Shoes, like the belt, may initially seem superfluous in a discussion about spiritual armor. They're great to have, sure, but aren't they more of a convenience than a necessity? Are they really that important? In this lesson, we'll learn why our spiritual shoes matter and why we need to make sure we're equipped with them before we get onto the battlefield. What purpose do shoes serve? Imagine a fully armed soldier. He has his sword, his shield, his helmet, his breastplate and his belt...but his feet are completely bare. The picture probably seems strange, and it should! Just by thinking about it, we can tell something is missing. But the problem goes beyond just looking odd. A shoeless soldier could run into real trouble in the heat of battle. Unless he is fighting on Astroturf, he is going to encounter some debris. It may be nothing more than twigs and pebbles, but to a bare foot that can cause serious pain—and one of the last things you want to deal with in the middle of a fight is worrying about where you step. What is the gospel of peace? Are there different gospels in the Bible? The gospel of the Kingdom, the gospel of Jesus Christ, the gospel of the Kingdom of God, the gospel of the grace of God, the gospel of peace—these are some of descriptions attached to the word gospel throughout the New Testament. Do all these different qualifiers mean that there are multiple gospels set forth in the Bible? In the apostle Paul's day, he walked countless miles in delivering the good news. Today, transportation and communication have changed, but we must also be constantly ready to do our part to spread the good news. The sandals of the Roman soldier "often were fitted with nails, or armed with spikes, to make the hold firm in the ground" (Albert Barnes' Notes on the Bible). God's good news and our mission—our marching orders—to preach it serve as our firm foundation. When we truly allow ourselves to take comfort in the good news promised by God, there is nothing from outside ourselves that can trouble our hearts or give us reason to be afraid. Christ has overcome the world (John 16:33), and so we have nothing to fear from it. Behold, I give you the authority to trample on serpents and scorpions, and over all the power of the enemy, and nothing shall by any means hurt you. Nevertheless do not rejoice in this, that the spirits are subject to you, but rather rejoice because your names are written in heaven. Just as shoes allow us to walk on otherwise painful terrain without fear, so the preparation of the gospel of peace allows us to traverse the otherwise painful trials and tribulations of life without fear, knowing that what awaits is greater than anything we could possibly suffer in this world (Romans 8:18). Why is it called a gospel of peace? Now it shall come to pass in the latter days that the mountain of the Lord's house shall be established on the top of the mountains, and shall be exalted above the hills; and all nations shall flow to it. Many people shall come and say, "Come, and let us go up to the mountain of the Lord, to the house of the God of Jacob; He will teach us His ways, and we shall walk in His paths." For out of Zion shall go forth the law, and the word of the Lord from Jerusalem. He shall judge between the nations, and rebuke many people; they shall beat their swords into plowshares, and their spears into pruning hooks; nation shall not lift up sword against nation, neither shall they learn war anymore. God has given His Church a tremendously large job: to preach the gospel of the Kingdom of God to the entire world! Take some time today to consider a person or group who needs to hear this good news. Pray that the message will reach the person or group in the most effective way. We welcome your ideas and suggestions as well. What Is the Gospel That Jesus Christ Taught?